Marantz reveals more details on 10 Series Reference range | What Hi-Fi? The PM-10 amplifier and SA-10 disc player replace the 12-year-old Legendary series. Marantz announced a new high-end Reference range of products back in June, replacing the much-lauded Legendary series that launched 12 years ago. And we've now had the chance to hear a little more about the new 10 Series. 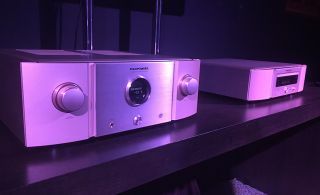 The range has been designed by Marantz’s long-standing audio guru Ken Ishiwata alongside Rainer Finck (who developed the original single-bit DACs for Philips back in the 90s). The new range consists of the PM-10 integrated amplifier and SA-10 SACD/CD player/USB DAC. The PM-10 follows the original SC7’s pre-amp topology packing a fully balanced analogue pre-amp stage, and has the ability to deliver the same amount of power as the MA9 mono power amp, offering 200W per channel into an 8 ohm load. That output is claimed to double into 4ohms. Alongside a whole host of connectivity for just about any set up, the PM-10 features both moving magnet and moving coil phono stages for hooking up a record player. It will be available in February 2017 for £7000. The accompanying SA-10 supports CD and SACD discs as well as data discs for high-res audio, with a USB-B port for PCM playback up to 32-bit/384kHz and DSD up to a futureproofed 11.2MHz. In an unusual move the company has engineered its own, high quality disc transport - an action forced by the lack of high quality OEM SACD drives on the market. It's had a close look at the digital-to analogue process too, developing a system in-house (Marantz Musical Mastering) that converts PCM signals to DSD streams before being filtered to deliver an analogue output. The SA-10 will also be available in Feb 2017 for £6000. Keep an eye on whathifi.com for more when we have it.